I have no interest in eating an elephant, but I understand the metaphor. If you're trying to accomplish a sizable goal, you need to chunk it into smaller, more palatable, achievable steps. Tis the season for goal making, and many of us are ambitious and have the best intentions, but the key to success, experts say, is in starting small. For example, you may have a 2015 goal of running a marathon, but you need to be able to run a 5K first. You have to make small changes, different from what you've already been doing, that advance you toward your goal. Regardless of your goal or intentions for 2015, there are simple changes you can make that can have huge payoffs in the coming year. 1. Before your morning coffee, start with a tall glass of water. Experts recommend that we drink half of our body weight in water ounces every day. Starting the day with a glass of cold water may rehydrate your body after sleeping and fire up your metabolism for the day. With more water, your skin may look and feel better and you may have more clarity in your thinking, given that your brain is about 75% water. And who wants a dehydrated brain? 2. Wake up a half hour or an hour early. What could you do with that time that will get you closer to your goals? 3. Before going to sleep, read a chapter in a paper book. Avoid the e-screen health issues that are abuzz in the news today. 4. Before getting out of bed in the morning, stretch; and then again when you first rise. 5. Put your phone on "Do Not Disturb" after 7 or 8 at night and enjoy the peace and quiet of an unconnected life. 8. Start and end your day in a spirit of gratitude. Try a gratitude journal or jar. 9. Swap out a coffee or diet soda for a cold glass of water. 10. Having a sweet craving? Chew a piece of gum. Some people like the dessert flavors; others prefer mint flavors. Whatever works for you becomes your craving buster. 11. Tackle one drawer or chore you have been meaning to tackle. One drawer is less overwhelming than a total house overhaul. 12. Organize your closet. 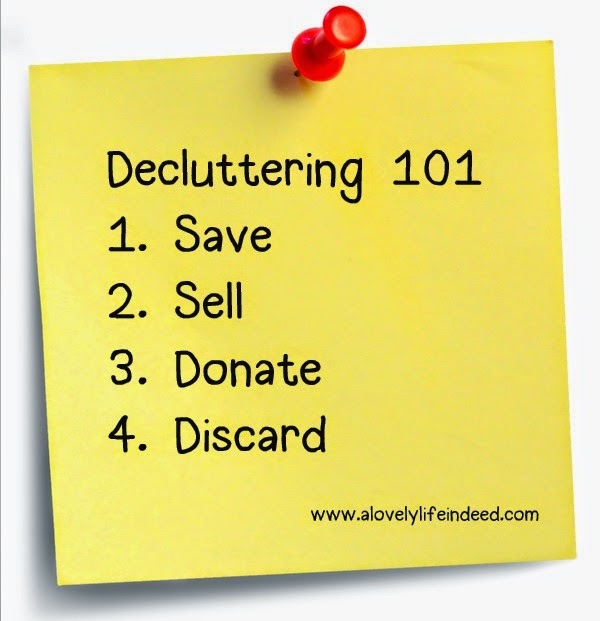 4 piles...save, sell, donate, discard. And then bring the donate pile to the car right away. And throw out the discard pile. Don't leave it in piles for another day. 13. Going through the Starbucks drive-through? Make someone's day; pay for the person behind you. 14. Losing weight? Donate one food item or pound of food for every pound lost to a local food bank. 15. Say thank you to someone for whom you are grateful to have in your life. Small changes can make a big difference. There will always be goal-related changes that will help you eat that elephant, but small changes, like these, can make a huge difference in how you feel and how you move onto bigger challenges. 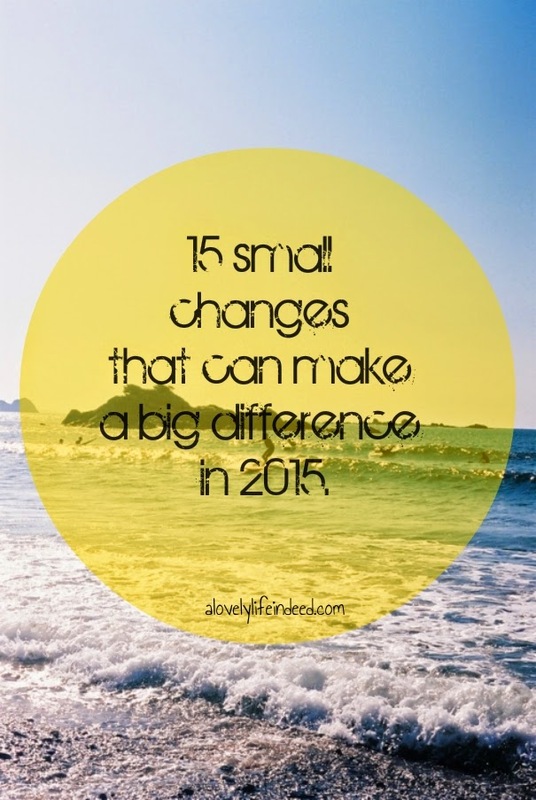 What small changes will you make in 2015? Small changes are what help us create lifestyles out of our goals and wishes! You need to start slow with a few little changes, nothing drastic. As your body and mind adjust to your new habits, everything falls in to place much easier! Definitely going with the small chunks thing. My husband is going crazy with the toddler mess around here. I'm trying to devote just FIVE extra minutes in the morning to picking up and ten extra minutes in the afternoon. Of course, I've tried it before and failed, but I'm hoping this is my year! This is one of the most helpful posts I've read recently. 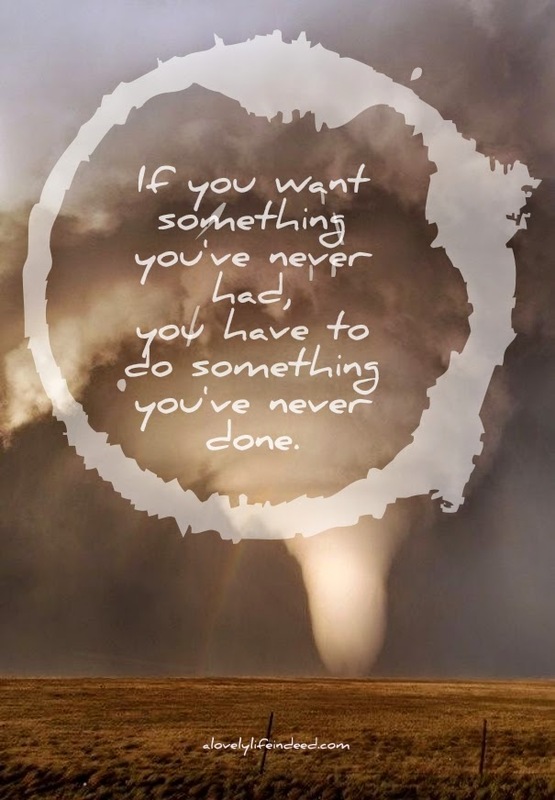 Thank you for this good advice about taking change in small bites...because change is change, no matter the size! I typically start out the day with 20 ounces of cold water. I just switched to warm lemon water, I'm going to see how that goes! I've read many health benefits. I'm also trying to get up earlier two days a week. Great list Kelly! You're right, you need to break it down to get it done. These are all such great ideas! I can use quit a few of them myself this coming year! These are great small changes that can lead to big change! The one-drawer approach is so helpful, while I was still on break from work I put on music and reorganized one cabinet and since I'd built up the steam, I tackled a second. Great list! Especially the gratitude! Small changes are the way to go. I drink water in the morning and I read every night before bed. something you've never had, you need to do something you've never done"
already got my large bag set for charity on items not used at the holidays. warm covers and peaceful sleep! Super Post! Thanks much. I like the idea of donating as you lose (or maybe double if you gain?!). I am definitely working on drinking more water and cutting back on diet coke. Reading instead of TV is hard for me because I'll keep going until I finish the book but maybe I just need to give myself a time limit!! I am always saying that it is the little things in life and I LOVE these little suggestions you have made! So simple and practical, yet can make such a big difference! Love this! A really great read! Ever since I got my Fitbit, I've been obsessive about those stairs and parking in the far end of a parking lot. Little things add up! I like drinking lemon water. And I achieved a small goal today by not eating any sweets at the bakery where I work- a major accomplishment, actually! I *really* need to break my habit of scrolling through Instagram when I get into bed. You're right, reading a book is so much better. Well I love your bullet points! What great motivating ideas. I have jotted a few down to practice! Happy New Year to you and yours! Such a great post, and so true. Thanks for the suggestions! All of these are great, especially the ones surrounding bedtime (waking up earlier and reading a paper book before bed). Just have to discipline myself--any tips for that?!? I do too, Laina. When I was in grad school, I would call my mom after my first classes of the semester, overwhelmed and wondering how I would get it all done while teaching full time. She would remind me to break it down...one step at a time. It leads to success because it's so much more manageable. Thanks for stopping by! Thank you, Carolann. Good luck! Thank you, Tam! And thank you for visiting! Dehydrated brain? No thank you!! I just drank a few cups while reading this post, you've actually changed my perspective on a few things with this post! Thank you for a better 2015! These are great ideas, and I especially love that quote in the post and I am going to pin it right NOW. I am sure the FitBit is a motivator, for sure. I am leaning toward getting one for myself. Thank you for stopping by, Juli! Thank you, Mandee. I am so happy to hear that you enjoyed this piece. You're right...the little things are so important...for big changes and for noticing how great life really is. The idea of doubling is genius, Kate. You could set an alarm and with something else to do after...maybe 10 minutes of meditation? They have great ones online, if you don't have any that you normally use. Thank you, Peggy! I don't blame you for wanting to say warm a bit longer. Today, schools in my area have cancelled classes because of the -25 wind chill. Brutal! I love decluttering...it feels great when it's gone Stay warm, friend. You have great habits in place already. Anything you would add to the list? I think I would add working on a new hobby for an hour a week or some reasonable amount of minutes multiple times per week. Thank you, SMD's Momma. :-) When we live in a spirit of gratitude we begin to realize how amazing life, especially our life, really is. Thank you, Kathy! You are well on your way! When we live in a spirit of gratitude we begin to realize how amazing life, especially our life, really is. Is there anything that you would add? Thank you, Rachel. I love the feeling of accomplishment when I tackle a task that has been on my list. One and done. And then, on another day, repeat. Good luck! Happy New Year and thank you for stopping by! My MIL drinks lemon water every morning. I don't like it very much, but over time, I think I could get used to it, given the health benefits. Thanks, Steph! Small steps lead to success because they're so much more manageable. Have a great rest of your week. Stay warm. Small steps lead to success because they're so much more manageable. I am so happy to hear that you enjoyed this piece, Carol. Thank you! Agreed, Rebecca. Small steps lead to success because they're so much more manageable, and as you said, transition time helps. These are great, and they are rather simple to do. Happy New Year! I just finished a big glass myself. Happy 2015! That's great, Nina. I am so happy you found this helpful. Happy Sunday! Thanks, Amanda! Baby steps work for me, and I think for many others too. Happy Sunday! I love this list. I am trying to drink a whole lot more water this year...and ditching the coke.